Lessons 1 and 2 in this package introduced negotiation and the characteristics of skilled negotiators with video clips in which the parties use informal English in their negotiations because they know each other well. In business, politics and other situations, however, a more formal tone is expected as parties may not know each other well and they want to make the best possible impression. The negotiators may also represent other parties such as a board of governors, which creates a further need for formality. In these situations, it is important to use formal English. This lesson will introduce the common early stages of formal negotiation and analyze the language needed to engage in these early stages. Formal business negotiations follow typical stages and it is important to recognize them before learning the language needed for each stage. Complete Task 1 to learn about the early and mid-stages of a business negotiation. Task 1: Matching. Drag and drop the stages on the right to the appropriate stage number on the left. Now watch the following video and notice these stages and the formality of the language used. The beginning of this negotiation is typical because it contains the stages that most parties expect to go through when trying to reach a formal agreement. Task 2: Complete the following summary explanation of the negotiation shown in the video. There is a great deal of variety in the language that can be used in different stages of formal negotiations. Complete Task 6 to learn a wider variety of expressions. Task 6: Complete the chart below by writing the appropriate heading that best describes the language in each column. Choose headings from the following box. On behalf of National Cement, we would like to welcome you to Hong Kong. How was your flight to Hong Kong? It is our pleasureto welcome you to our head office at National Cement. I’d like to start by suggesting the following agenda. Shall we get started by agreeing on a framework for today’s discussion? Perhaps we should establish a general procedure. Let’s begin by agreeing on a procedure for today’s negotiation. Let’s begin by establishing a framework for today’s negotiation. We do not expect to reach an agreement in today’s negotiation. We are here today simply to explore our options. We are here mainly to test the water. We see today’s meeting as a means of investigating our options. We have joined today’s meeting mainly to hear your terms. Your proposal contains several interesting points, although we have a few concerns. This proposal sounds appealing, although we do have several concerns we need to discuss. We would need to run it past our board first. We do not have the authority to decide by ourselves, so we will need to get back to you on this. It is wise to keep a notebook of the phrases that you feel comfortable using and to practise saying them as much as possible so that when you negotiate for real you will appear confident and speak smoothly. When people introduce themselves, they often omit words which are already understood by everyone. This may occur even in formal situations and negotiations. Task 8: Fill in the blanks with the words from the box below that were omitted by each speaker. Which words were omitted by the speakers because they were understood? Lin:	Hello. My name is Lin Chan. Lin:	I am the Sales Manager for National Sugar. Lin:	And this is my associate, John Martin. Victor:	I am very pleased to meet you. Victor: We are just testing the water you might say. As discussed in Lesson 2, two qualities of skilled negotiators are being confident and showing respect and understanding for the position of the other party/parties. Task 9i: Which two sentences from the video show confidence? Check the box next to two sentences. 1. Hello. I am James Brown, Sales Manager for Coca Cola. This is my associate, Peter Jackson. 2. Very pleased to meet you. I’m Ann Taylor. And this is my legal advisor, Mary Smith. 3. I hope you had a relaxing journey here. 4. Yes very much so, thank you. 5. Are you in town for long? 6. No, we need to return to Hong Kong tonight. 7. We are prepared to offer you a very good price which will be a ‘win-win’ result. 8. Well, we see it as an investigative trip. We are just testing the waters. 9. We don’t expect to reach an agreement today. Anyway, we need board approval on all decisions. 10. You haven’t heard our proposal yet. The term might be hard to refuse. 11. We understand you need time to consider. Our main objective is that negotiations remain open. 12. What’s your proposal Mr. Jackson? 13. We are willing to offer a very attractive price for a minimum sale if you can commit to a 2-year contract. Ann will clarify the terms. Task 9ii: Which sentence in the video shows respect and understanding for the position of the other party? Put a [√] next to one sentence only. What was covered in Lesson 3? Take the summary quiz! Task 10: Quiz: What did you learn about the stages and language of formal negotiation? 1. In formal negotiations, each party should only introduce his or her name. 2. People may not speak in full sentences when they introduce themselves. 3. 'Small talk' means making informal conversation. 4. Small talk may occur prior to negotiations in some cultures. 5. Opening statements are usually made by the party that was invited to the negotiation. 6. It is normal for each party to state their expectation(s) near the start of a negotiation. 7. It is not acceptable for one party to state that they do not expect to reach an Agreement during a negotiation. 8. A ‘win-win’ result is a situation where one party receives more than the other. 9. A first priority is a main goal or objective. 10. An exploratory tool is a way of gathering information. 11. To run it past the board means to receive authorization from a company’s governors. 12. 'We would have to run it past our board' may be a tactic for delaying Proceedings or not committing to an agreement. 13. People may use 'on behalf of' when speaking for themselves. 14. 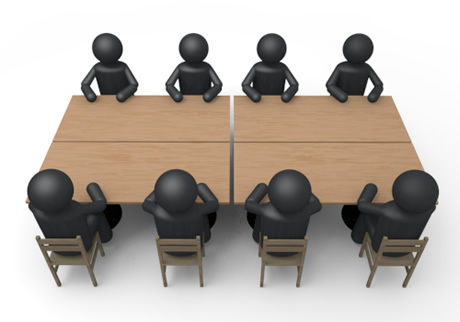 One reason negotiations may be formal is that parties are speaking on behalf of a board of governors. 15. 'Perhaps we should establish a general framework' is a way of agreeing on a procedure for the negotiation.